I didn’t mean to take such a long break…but now that I have it’s sure nice to be back in this blogging space! When Dear Stella sent me this fabric to work with I knew this design would fit it perfectly. It was so fun to work with something a bit more manly and boy-ish…and these fabrics would make the best camping/outdooor quilts ever. The fabrics are Take a Hike by Dear Stella (in stores soon!) and the pattern is Pow Wow. 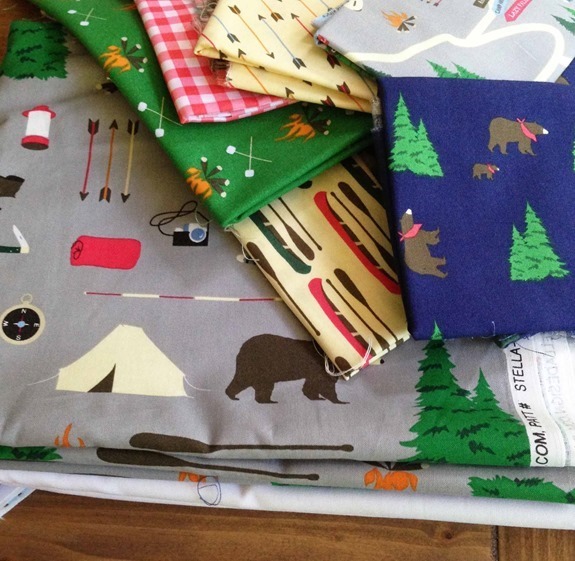 I am now seized with the inspiration to make quilts for my boys just especially for our camper with these fabrics! Great fit with the pattern too! That is really adorable. I love the pattern, but I also love the fabrics. So cute! I always have a tough time finding really cute fabric lines for boys. Allison, off the subject, but can you please let me know who you use as your site host/domain and how easy it may be to use? 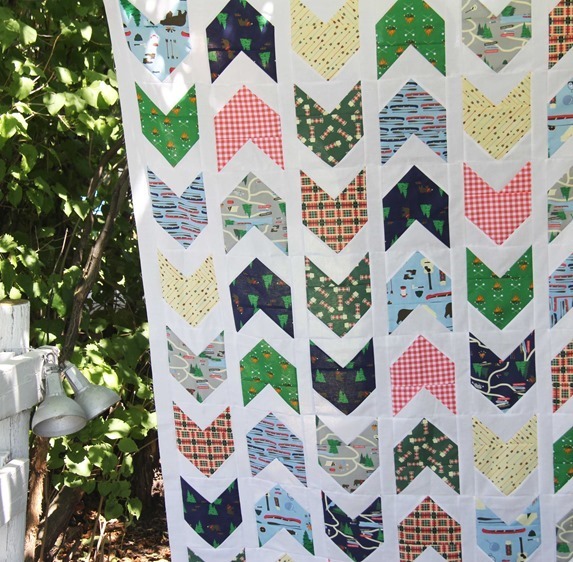 Another cute quilt from you! This fabric is adorable. It's not so much that I can't find masculine fabrics at all, it's just hard to find ones that feel fresh and stylish like this collection does. Thanks for sharing this one; I'll be looking for it when it hits the shops! Oooh gotta have the arrows. I just finished the top for a crib pow wow quilt from my nephew and can't wait to see it once it comes back from the quilter! I love your quilt with the dark camping fabrics. I can't decide whether they look more like animal tracks or walking path arrows – either way it's lots of fun, and needs to be taken camping! fantastic quilt! Those fabrics are so cute. Yes, I think a male person of any age would like this one. I bought this pattern from you a while back. Now I'm even more inspired to make it. I've been enjoying the outdoors and not spending much time with my sewing machine. (I'm from the Seattle area too.) nice job! Love the canoe fabric! Great quilt! 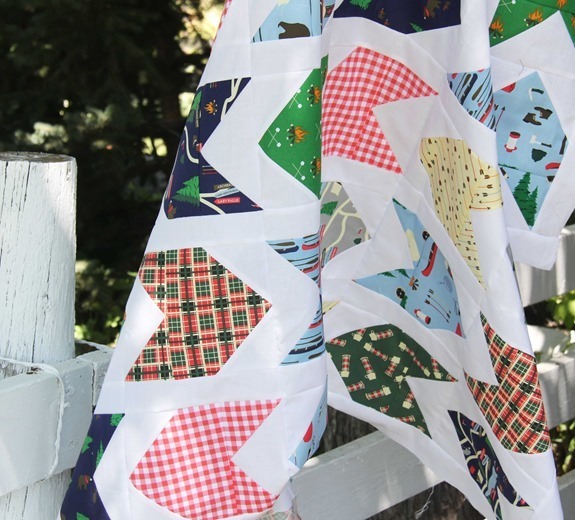 The quilt is so cute and welcome back in Blogland. Wauw! I just love your work. 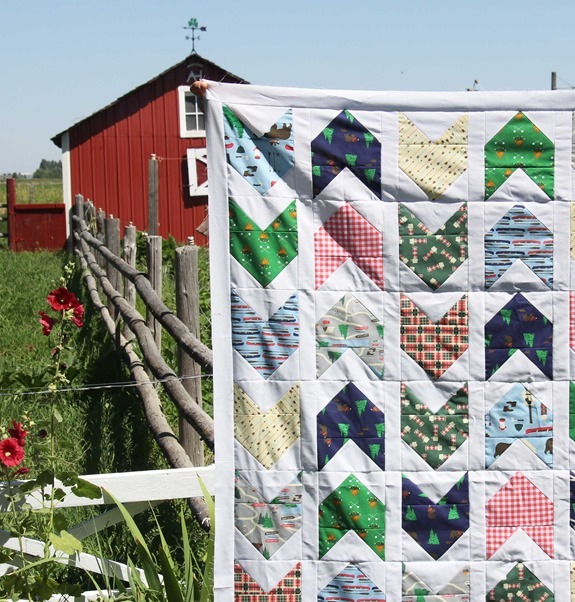 I've been wondering if I should give quilting a try but now I'm convinced! Love this quilt! Might just be making one for my brother this Christmas! The beautiful quilts! This fresh. Beautiful fabric patterns for the boy. Alison: I love this quilt. Love the colors, the over-under, the feeling of a summer afternoon. Thanks you. I have to admit, I totally love the barn picture in this post!